The Protect Your Pet Card quickly informs emergency services that you are a pet owner with pet/pets waiting for you at home. 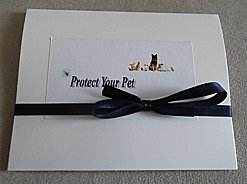 The card has the name, number and address of the person you have chosen to be contacted about your pet/pets. The card then informs the person you have chosen to care for your pet about your pet's food, special needs and veterinarian's phone number. 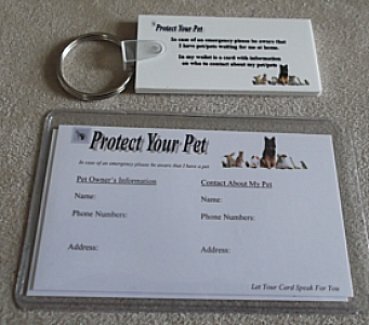 The Card is a water proof durable card where after writing down your information, your pet's information and the information of the person you have chosen to be contacted concerning your pet, it is then placed in a transparent sleeve for even more protection. According to our local police services, in case of an accident or medical emergency where you are unable to verbalize your information, an officer will look through your personal items, such as your wallet to verify your identification. The Protect Your Pet Card is wallet sized so that it can be placed behind your license or any other identification card, and immediately informs emergency services that you have pet/pets waiting for you at home. One Protect Your Pet Keychain which states, "In case of an emergency please be aware that I have pet/pets waiting for me at home. In my wallet is a card with information on who to contact about my pet/pets." 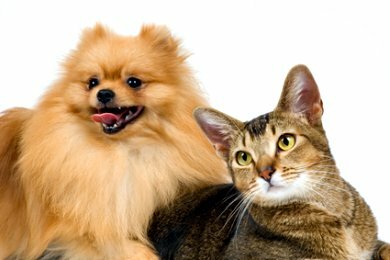 Your Protect Your Pet Card provides the peace of mind knowing that in an emergency situation where you are unable to vocalize that you have a pet/pets or your pet's needs, your card would speak for you, making sure your pet/pets will still be cared for, Get Your Card Today!